Take your a moment just imagining that you are on a long air, bus or train trip, what things do you like to do to kill your boring time? Sightseeing, thinking, taking a nap, listening to music, or watching movie? Watching movie, most people like to choose. Then please imagine again that on such a long trip, how many movies or how much time you can enjoy (videos) with your computer, network, or some portable devices? 1 hour, 2 hours, or 3 hours? We know that the best device or computer we owned just has 2.5 hours battery life. So now I’d like to ask: When on a long (5 or 9 hours) trip, you are enjoying your first or second movie at the climax, suddenly, the power is off, you have to stop, will you feel very upset or bad at this moment? Yes, I will. I had ever experienced such an unsatisfied situation and have always waiting for a wonderful media player which can let me enjoy movies for longer time on my long trip. 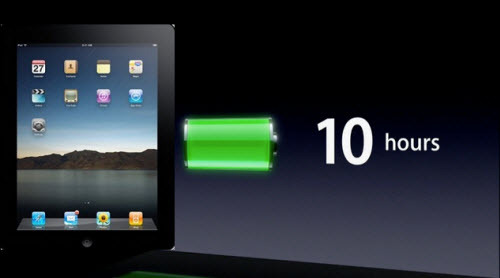 Now iPad hits the market with 10 hours battery life for playing video. The first time Jobs said the iPad would have a 10-hour battery life on January, 2010, I was so excited and just for this reason, I preordered my current iPad. Now I got my iPad and confirmed that iPad has been the fact that this sucker will keep running on battery power for 10 hours. Wow, this is indeed one of the most highly praises of my iPad. My great iPad has ultra sharp wide screen display for playing MOV, MP4, M4V videos, up to 720p high resolution. And I have lots of movies like FLV, AVI, M2TS, MOD, TiVo, MKV, VOB, WMV, DRM-MS, VP6, OGG, etc on my computer. In order to prepare and put some movies to my iPad for my next business trip, I have to convert them first and then import to my iPad for playing. So I just use Aunsoft Video Converter for Mac as a Mac iPad Video Converter and import the movies to the program and convert to MP4 format. Then I sync them to my iPad via iTunes. Wow, the quality is so perfect beyond my imagination. I’m so pleased with my iPad for enjoying movies on such a great screen for such a long time. And I will not feel depressed any more when watching movie on my long business trip, I will never experience the situation of “Must stop my movie enjoyment”. So amazing! I love my iPad and its 10 hours battery life.